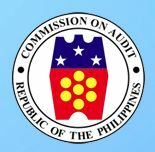 The Commission on Audit (COA) thrives in a culture of excellence and in order to ensure that its services are at par with the international audit community, the Commission adopted the International Organization of Supreme Audit Institutions (INTOSAI) Supreme Audit Institution (SAI) Performance Measurement Framework (PMF) to measure the Commission’s performance through COA Resolution No. 2017-023 on 21 December 2017. The SAI PMF is an international framework for self, peer, or external assessment of a SAI’s performance against the International Standards of Supreme Audit Institutions and other established international good practices. It is applicable to all types of SAIs regardless of organizational model, mandate, national context and development level. The SAI PMF was adopted by the INTOSAI during the XXII Congress held in December 2016 in Abu Dhabi. However, a key principle of the framework is that the assessment is voluntary, and that it is the Head of the SAI that makes all key decisions about the assessment. “Adopting this framework is important for us to gauge our performance of our audit and non-audit functions and the strength of our legal mandates and environment. It will also help us identify areas that we need to improve on and accordingly adjust our capacity-building programs,” said COA Chairperson Michael G. Aguinaldo. “By showing our commitment to adhere to the highest international standards, we are also contributing to better quality public services that will ultimately benefit society,” added the Chairperson.